You are a mutant in this adventure game and there is a war going on with the aliens as they are trying to capture your home planet. Fortunately you will get more backup and greater firepower as time passes by. You should try and survive for as long as possible in order to make some progress and actually win some battles. Move around the dead space and shoot your gun at the enemies until some backup arrives with a carrier ship. They can drop very useful power-ups like clones and even weapon enhancements that will deal some serious damage. 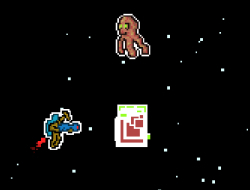 Use the arrow keys to fly and space to shoot. World of Mutants 0.00 between 0 and 10 based on 0 votes.